The one major gripe I have with this issue with respect to story is that its little more than a villainogue of Forever Evil. The first issue gave us a pretty damn good face-off between The Rogues and two members of the Crime Syndicate, ending in a rather tense moment which got picked up in issue two that saw the status quo for Captain Cold changed for the duration of the event, and possibly more than that as well. With the supervillain team ending up in Gotham for the third issue, the members are now up against all the crazies of the city, which has been parceled off to the various villains now that the Batman is gone. And the way that this issue ends, you can expect the team to be here for at least one more issue. And that’s not what I’m looking for. I want the Rogues to do something directly opposed to the Crime Syndicate, to get a rematch with those villains of Earth 3 who masterminded the entire Trinity War and have presumably killed off all the major heroes of Earth 1. Which hasn’t really happened for an issue and a half now, leaving me disappointed. On its own, Rogues Rebellion #3 is a pretty fun story that sees the Rogues go up against both Poison Ivy and Man-Bat, but overall from an event-wide perspective, this is too small a story and without any seeming major twists. Plus, given that Gotham is supposed to be torn up between Scarecrow and Bane, with both sides leading their own armies of Arkham freaks against the prisoners of Blackgate, I’m not sure how Rogues Rebellion #3 fits in with all this. Man-Bat is supposed to be involved with helping Scarecrow raid against Bane’s power centers, and the same is true of Poison Ivy as well. What I’m saying is that I wanted this comic to hew much more closely to the larger events of Geoff Johns’ Forever Evil and to see the Rogues do some pretty crazy, outlandish stuff that would harm the Crime Syndicate. The new villainous overlords of Earth 1 had a hand in destroying Central City, and this is a big reason why the Rogues are against the Crime Syndicate. We don’t see that explored in this issue. All the same, the issue has some great scenes between Mirror Master and Heatwave, which add to both their characters, and makes them feel much more rounded. And Brian writes a really neat Poison Ivy, which I loved. Scott Hepburn is joined by Andre Coelho for this issue as internal artist and they divvy up the script between themselves, handling different aspects of the script. The consistency in their artwork is definitely there, but I have to say that I don’t really see why there is any division at all and have no idea why Scott Hepburn needed the extra boost. Regardless, their pencils are top-notch and I really enjoyed this issue for the most part as far as the art is concerned. The only negative comes from the panels which show The Ventriloquist. She is nothing like how she’s been drawn in Gail Simone’s Batgirl and that’s a shame since I really enjoy that version of the character. Finally, Nick Filardi is back to do an awesome job of the colours, and they are definitely one of the many winning aspects of this comic. Overall, I’m concerned with where the mini-series is going story-wise, but on its own, it remains a fun little book. More Forever Evil: #1, #2, #3; (Arkham War) #1, #2; (Rogues Rebellion) #1, #2. 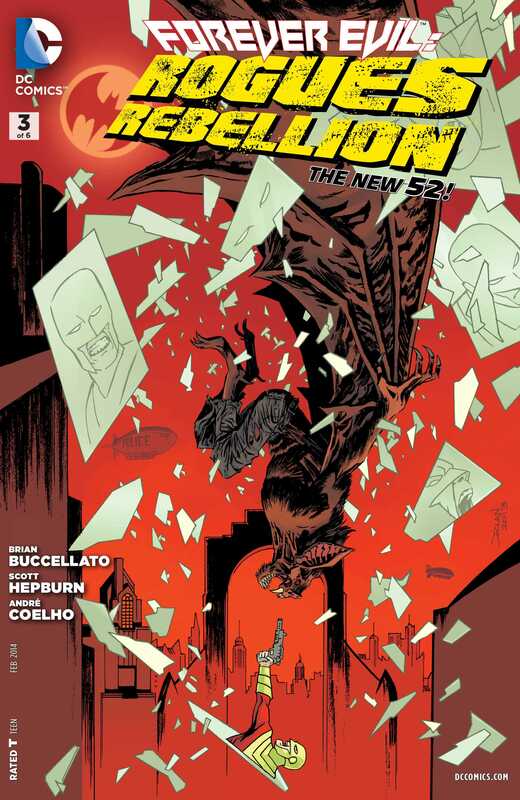 Posted on December 22, 2013, in Comics Reviews, Review Central and tagged Brian Buccellato, Captain Cold, Comics, Crime Syndicate, DC Comics, Forever Evil, Forever Evil: Rogues Rebellion, Gotham, Man-Bat, New 52, Nick Filardi, Poison Ivy, Review, Review Central, Rogues, Rogues Rebellion, Scott Hepburn, Supervillains, The Flash, Weather Wizard. Bookmark the permalink. 4 Comments.